News of HP’s split into two companies is drawing praise from analysts and investors alike. The decision has been identified as “a bold and smart move” with the potential to “spur innovation and add shareholder value.” The company plans to divide itself into two separate companies. One of which will focus on enterprise services, software, and servers and will be called Hewlett-Packard Enterprise. The other will be called HP Inc., and will focus on printing and PCs. This split will allow the respective companies to emphasize development of products within each concentration. The move comes at an interesting time for HP, as they have seen strong competition from Lenovo in the PC market. Argus Insights tracked US consumer technology markets to find that Lenovo’s Net Promoter Score is steadily increasing, which indicates their rising demand over HP. HP is currently discussed more often by consumers than Lenovo, but during this split, they should be careful not to alienate their current consumers and add to their competitor’s growing customer bases. Examining the evolution of both HP and Lenovo in various consumer technology markets shows that both companies have improved from Q2 to Q3 this year. Lenovo now has a higher Net Promoter Score, which proves that they are pleasing their customers more. 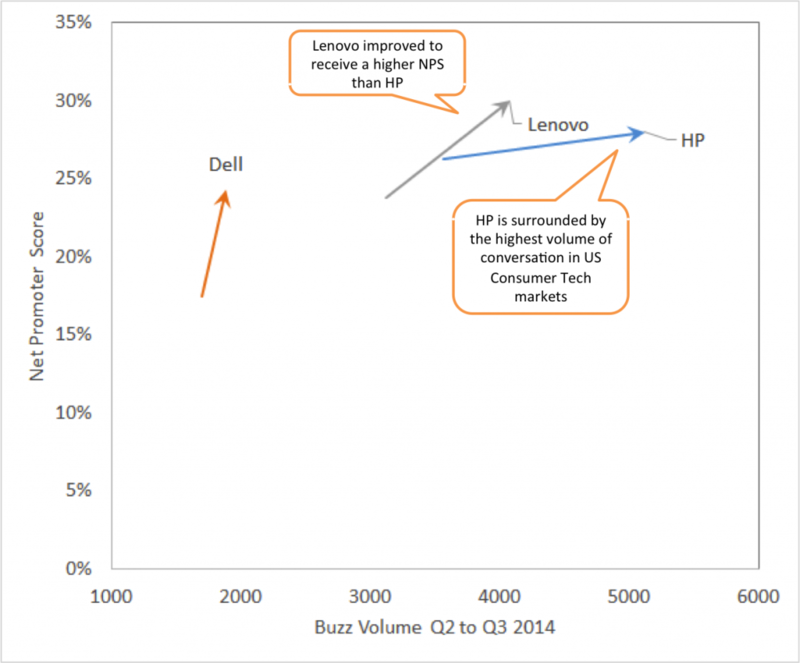 However, HP continues to receive more attention from consumers, and their NPS score is only slightly lower than Lenovo’s. Lenovo has surpassed HP with more worldwide shipments specifically in the PC market, but HP remains ahead in overall consumer mindshare. HP needs to leverage this lead and be careful not to confuse their consumers with this split. Looking at the trajectory of both companies, it is clear that Lenovo is experiencing a sharper increase in consumer satisfaction. HP’s split seems to be designed with this in mind, as the two separate companies will be better able to focus on developing delightful products. There is some speculation to this point however. As Dell was quoted to say that HP’s split “appears to benefit HP and its shareholders more than its customers.” HP as one company saw increased NPS and Buzz Volume from Q2 to Q3, but after they split into two sharply focused companies, will they be able to maintain this positive progression? For more information please contact us at Argus Insights. We can tell you what your potential customers want so you can give it to them! For custom reports, access to our data, or personalized consolation, please visit our website. Xiaomi Stealing Mindshare from Samsung in Wake of Low Earning Reports	What Extinguished Amazon Fire Phone Sales?